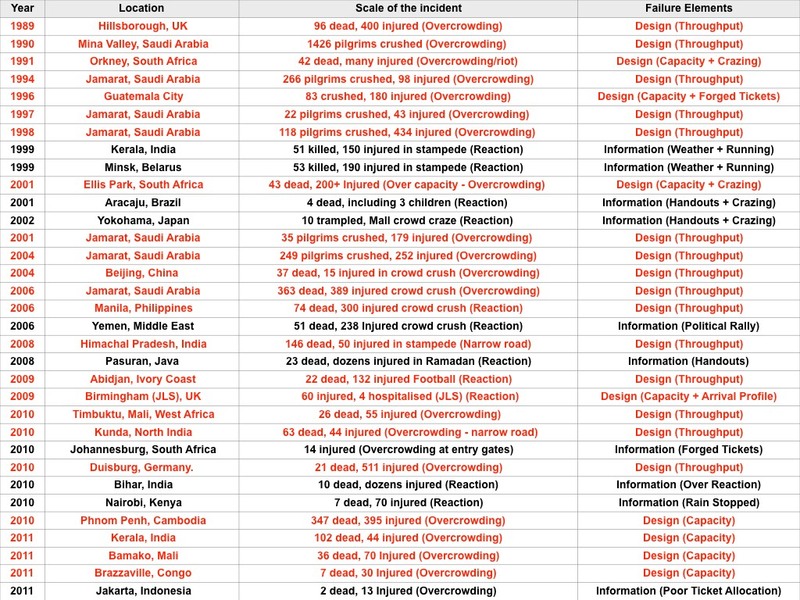 If we examine the underlying causes in worldwide crowd related accidents we observe that there are some fundamental (root/distal) elements in common. In all cases accidents/incidents don't just happen - there is always a cause. 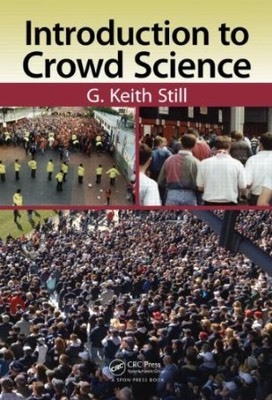 Typically, the underlying cause is a lack of awareness of the problems related to crowd density and crowd flow. High density produces a interpersonal force that, if left unchecked, can be fatal. See this page for further information. 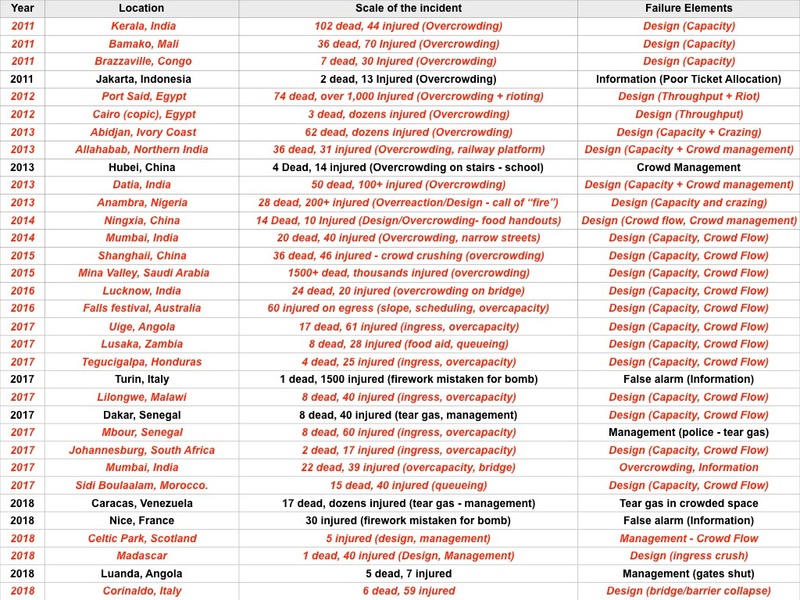 Over the last 27 years there have been a number of significant crowd related disasters. Below is a short list (but not all). We reviewed the factors/elements of these disasters to understand how they occurred and how to anticipate/prepare/prevent similar incident occurring int he furtutre. The DIM-ICE risk model can be adapted to improve understanding of causality in accident/incidents and how we can develop better teaching programme to try and prevent future accidents that have similar underlying causes. That is it’s purpose, risk analysis (using the historical framework as a reference). As we can see from the above there is a high percentage of design related disasters - these are typically where there are more people that the space can�accommodate safely. Like trying to pour a quart into a pint pot….it won’t fit, it will overflow. One of the key elements of crowd modelling is to understand the capacity of the space, how quickly it will fill and what time it will take to reach critical density. This does not need complex�computer simulations as a simple first pass capacity�analysis gives us clear indications whether a system will work (or needs a radical design change). In essence, if a system fails a first pass approximation, then it should be rejected and alternative solutions need to be investigated. We don't know how many people may come to this event? How do we monitor/count people for large gatherings? I've developed a few tools/techniques/methodologies - but it's really down to the basics.�Planning, planning, planning! Most importantly the concept of "risk" is generally considered as a value (likelihood x consequence = risk).�But risk is dynamic. Risks can change with time. How do you assess different types of risks as they evolve over time? How are you assessing the degree of risk in dynamic environments? What metrics do you use for risk assessment? I know that there are risks that are static (i.e. : can be assigned a single value), but do you differentiate static and dynamic risks in your environment? How to you identify these risks in your risk assessment, do you use a single value for both static and dynamic risks? Should you differentiate - if not why not? Doesn't�that seem a bit obvious? By way of an example (from my own field of expertise) risk of trips, slips and falls is zero before an event starts (no crowds), then this risk becomes higher at the entry points (depending on terrain, numbers of people, entry system etc) then lower again (but not zero) during an event (internal crowd movement around a site) and higher again during egress. Risk of trips, slips and falls becomes suddenly very HIGH during an emergency egress. There is no dimension of time and there are typically no references to specific conditions, or times as they relate to scales of this particular risk.�If we consider just this simple example of trips, slips and falls - it is best described as a series of maps. I'd call that a�qualitative risk map - something that I can see the location, time, duration and severity of the risk (Red, Amber, Green is sufficient) on a map. I typically�produce different maps for different time, making sure that the risk is illustrated and shown as a dynamic,�changing, risk. How do you differentiate static and dynamic risks in your environment? How do you communicate these types of crowd risks in your risk assessment?